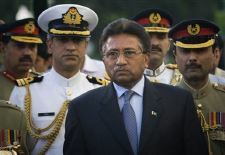 In a nationally televised speech, Gen. Pervez Musharraf, President of Pakistan, has just announced his resignation, pre-empting a move to impeach him by the parliament. 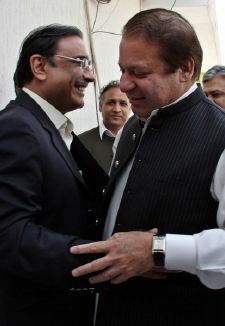 This post has been updated to add news photos from this momentous day in Pakistan’s political history. The pictures speak eloquently of the moods and thoughts of the day. (Scroll down to see the video of Gen. Musharraf’s resignation speech). 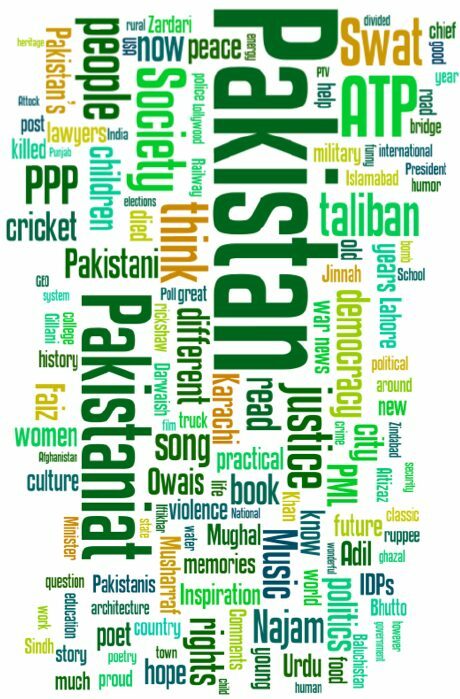 Participate in a poll on what might be Pakistan’s future post-Musharraf, here. 1998: Becomes army chief of staff. October 1999: Seizes power in a bloodless military coup, overthrowing the prime minister, Nawaz Sharif. In response, the Commonwealth suspends Pakistan’s membership. June 20 2001: Makes himself president, replacing Rafiq Tarar, while remaining head of the army. Tarar is forced out of office when the parliament that elected him is dissolved. July 2001: Holds first meeting with the Indian prime minister, Atal Bihari Vajpayee, at Agra in India. No progress is made because of differences over the disputed territory of Kashmir. September 2001: George Bush courts Musharraf, asking him to join him in his “war on terror” and help defeat the Taliban in neighbouring Afghanistan. The US president promises Pakistan $1bn in aid. April 2002: Wins a referendum giving him another five years in office. Observers criticise the referendum as blighted by irregularities. May 2002: Pakistan test fires three medium-range surface-to-surface missiles capable of carrying nuclear warheads. Musharraf insists his country would not be the one to initiate war. August 2002: Consolidates his power still further, giving himself the right to dismiss an elected parliament. October 2002: Pakistan’s first general election since Musharraf seized power in 1999 results in a hung parliament. November 2002: Mir Zafarullah Jamali becomes the first civilian prime minister since 1999. He is a member of a Musharraf-supporting party. November 2003: Pakistan’s National Assembly meets for the first time since 1999. December 2003: Musharraf promises to step down as head of the army by January 2005. May 2004: Pakistan is readmitted to the Commonwealth. December 2004: Musharraf announces he will stay on as head of the army. August 2005: Pakistan tests its first nuclear-capable cruise missile. March 2007: Musharraf suspends the chief justice, Iftakar Mohammed Chaudhry, triggering a wave of anger across the country and the first joint protests held by the parties of exiled former prime ministers Benazir Bhutto and Nawaz Sharif. October 2007: Signs a corruption amnesty, opening the way for Bhutto’s return and a possible power-sharing agreement. Within hours of Bhutto’s arrival back in the country, bombers attack a Bhutto rally in Karachi, killing more than 100 people. November 2007: Declares a state of emergency, rounding up opposition leaders at gunpoint. 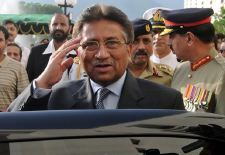 In the same month, Musharraf quits as head of the army, becoming a civilian president. December 15 2007: Lifts state of emergency and announces plans to go ahead with parliamentary elections scheduled for January 8. December 27 2007: Benazir Bhutto is assassinated at an election rally in Rawalpindi. January 2008: Elections postponed until February 18. February 2008: The two main opposition parties gain a clear majority in the elections. 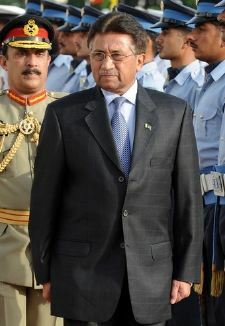 August 2008: The two main parties strike a deal to impeach Musharraf if parliament backs the move. We don’t wanna see even your face please don’t come back to Pakistan we hate you …………………. This life is too short just like a journey it’ll be ended soon and then you’ll have to pay what you’ve done……………. and you owe to 170000000 people what’ll happen to you ???????? Muluk par waqat kaysa karha agaya..
wah wah kia sheer khaha main nay..
BTW I liked him and his leadership, and I know for sure that there are many more like me who supported him. I understand that he too had his weak points, but then i think that we have to have the Lesser Sin. Just look what other options we have or had, and am sure time will tell that how big a blunder we did. If he was so good why did most Pakistani vote against him and his parties to throw him out?